Orange is one of the biggest carrier with presence all around the world - from Europe to the Middle East and even Africa. It’s a key factor for the success of Windows Phone, but up until now, the support for Microsoft’s platform on the side of the carrier hasn’t resulted in user adoption. Quite the contrary. Senior VP of devices and mobile multimedia at Orange Yves Maitre shared with CNET that Windows Phone is in fact the lowest-selling platform on the carrier’s European, Middle Easter and African lineups. Its sales put it Android, which has the most sales, iOS and BlackBerry, which Orange says has strong sales. "Honestly, it hasn't been as successful as we expected," he commented on Windows Phone. He was very specific about the biggest factor for the future success of Microsoft’s platform - Nokia’s unveiling of new devices next week at Nokia World, which could well be renamed to Windows World given the anticiapted announcements. Customers are also waiting for those new smartphones as Espoo is expected to bring the "pure Microsoft experience." But make no mistake - Nokia World next Wednesday will be watched closely by carriers as well, who’d have to decide on their spending to support the brand and Microsoft’s platform. Nokia has been very specific about its upcoming Windows Phone lineup - it will initially only launch in select markets, so that others where Symbian sales are strong don’t get disturbed, chief executive Stephen Elop himself noted. North America is of very high priority, but Yves Maitre says that it will be Europe that will be the decisive factor: "If Nokia/Microsoft is not successful in Europe, then it will be tough in other countries." Until the big announcement comes, Orange remains tepidly optimistic. The carrier, though, knows the value of the Nokia brand: “When you have a Nokia phone, it's like you're driving a Mercedes Benz," Maitre said. Well Windows phone is f*cked then! And, by extension, Nokia is f*cked as well.... Windows and Nokia were hoping the other would drive sales of their respective offering. What was Nokia's reason of not choosing Android as a platform? 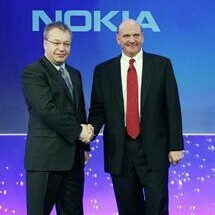 Pride maybe, also because of Elop's previous relationship with microsoft (he used to work there). Several reasons but among the key ones were that Nokia wanted some input into the growth of the platform, and Google wouldn't offer that - they basically said you can have the same OEM deal as Samsung/HTC. MS offered them more, including MS Office support to Nokia's other platforms (gradually coming along on Symbian), and Nokia Maps will become the default mapping software on Windows Phone (and can you see Google allowing that?). Nokia also have some sort of ability to differentiate/introduce features that other OEMS don't have, but it was never clear what exactly that means and we will probably have to wait until next year to see the fruit of that. SO it was clear MS was willing to work more closely with nokia and value'd nokia more than Android. See page six of this article (this link is to the right page) from business week to see a bit about how that decision was made: http://www.businessweek.com/magazine/content/11_24/b4232056703101_page_6.htm I actually think has Nokia not gone Windows Phone, they might have stayed with MeeGo rather than go to Android. Only time will tell if they were right to ditch MeeGo at all, as the N9 has had rave reviews from pretty much everyone, with the one downside being lack of apps, which would have been less of an issue had it been Nokia's main smartphone platform. I know the article says it would have taken too long to get meeGo devices to market, but had MS/Windows Phone said No, and given what the article says about Google, i think Nokia would have stuck with MeeGo in the end. Very well written, and a great link. Thanks, bluechrism!! Am I the only one who thinks that this is the other way around? Nope your right Nokia is f**ked if they don't put much effort into Windows Phone. Microsoft is staying put. Bit of both. Nokia is still huge and sold more smartphones last quarter than everyone except samsung & apple and don't have a windows phone yet. The wold is going nuts for the Nokia N9 and there are devices selling well. But yes, they do need to move on from symbian and get a presence in north americe and windows phone will get that, and it will be hard if it doesn't worlk. on the flip side, if this doesn't translate to good sales of Windows Phone with Nokia on board, MS might just pull out of the mobile market. If MS pulls out of the mobile market, Nokia is truly f*cked. Well, some say that Nokia is dead, but we can't agree : on all tech sites, the expectations for Nokia World are very high. Everybody wants to see what Nokia will do, because of the extraordinary reputation it has for making good, reliable and very good-looking hardware. All I hope is a 4.3" Windows Phone, at least announced, next week. The 800 will have a good design, like the N9 (a little less cause of capacitative buttons and more little screen), but it is not a phone that will make us say Wow. Altough we need Nokia make us saying Wow ! I am not so sure this partnership will be as great as the two parties were hoping for. What WP needs is in the immediate future is a hardware manufacturer that will go all out on specs, because that is what it takes to compete with Android right now. What Nokia needs is to make hardware with outlandish specs, because that is what it takes to compete with Android manufacturers right now. The problem, then, is that WP7 currently doesn't support the resolutions, dual core processors, and LTE radios that are making high-end Android devices so hot. This being the case, what the consumer is going to see are devices that come out with comparatively underwhelming single core 1.4 GHz processors, 3G radios, and WVGA resolutions. Basically, Nokia + WP7 = Great quality, great experience, but maybe not what is needed to sell to the masses right now. No offense to Windows Phone users, but Microsoft needs Nokia more than Nokia needs Microsoft. Even without proper carrier support in the USA; Symbian still managed to match if not exceed user share against Windows Phone 7. That's my opinion and the sad thing is that I am upset with the way Nokia sold out :(. Currently own and N8, and despite all the flashiness that other OS have; I still love my Symbian :)! - To each their own, but I will upgrade to the Meego N9 instead of any Windows Phone offering regardless of Nokia, HTC or Samsung. First of all, WP7 user here. Second, agreed that Microsoft needs Nokia more than Nokia needs Microsoft. A successful campaign with Nokia earns Microsoft a lot of market share that it otherwise would have had to battle it out for over a long period of time. However, if WP7 takes off, Nokia earns an entrance into the U.S. carriers on a hot platform, potentially earning Nokia the same type of brand recognition here as it has across the globe. Microsoft has more to gain, and Nokia is taking a bigger risk. Personally, if I were Nokia, I wouldn't have signed an exclusivity to provide only WP7. But hey, if WP7 gets more of the respect it deserves, and if the platform takes off, the bet will pay off. HTC and Samsung makes great windows phones. I think it will mainly depend on specs and not Nokia alone. Most are turned off by low specs compared to android.